In the early 90s, a young goaltender virtually unknown to the North American hockey world, was quietly but diligently honing his netminding skills in Turku, Finland. Miikka Kiprusoff played two seasons with TPS Turku before stepping into the international spotlight in 1995, when he was drafted in the fifth round by the San Jose Sharks in the 1995 NHL Entry Draft. Nowadays, the name Miikka Kiprusoff, is one of the most recognizable names in the world of hockey, and is inexorably tied to the Calgary Flames franchise. It’s hard to believe that at one point in his career, the hardest-working goalie in the NHL, was a backup tender relegated to third-line status. Miikka Kiprusoff’s first few years in North America were not all bad. In 1999, just after receiving the honours of Best Goaltender and Best Player of the Playoffs in the SM-Liiga, the 23-year old Finn left Europe to play in the AHL. With the Kentucky Thouroughblades, Kiprusoff enjoyed an all-star season and it didn’t take long before he was called up to make his NHL debut. Alongside another young goalie named Evgeni Nabokov, Kiprusoff worked to take over the starting position from Steve Shields. In his short tenure with the Sharks, Kiprusoff did see some positive reinforcement (in his Game 4 start in the 2001 Stanley Cup Playoffs against the St. Louis Blues, he became the first Finnish goaltender to win a playoff game), but a significant lack of ice time and a lack of success in the games he did play became a point of frustration for the young goalie. With Steve Shields gone, Kiprusoff ultimately lost the starting role to Nabokov, and in the 22 games he played as backup, only 5 games were victories. The beginning of the 2003-2004 season did not get any better, with Vesa Toskala joining the Sharks and creating more competition for the role of backup. Kiprusoff was benched for the first quarter of the season, and it came as no surprise to anyone when the Sharks finally traded him to the Calgary Flames for a second-round draft pick. November 16th, 2003 is a date that should be revered by the entirety of Calgary Flames fandom. It was the day the franchise picked up a little-known goaltender from the San Jose Sharks. With their starting goalie Roman Turek out with an injury, the Flames needed a quick fix, and a good fix. Miikka Kiprusoff turned out to be both, and in the biggest way possible. Just four days after the trade, Kiprusoff’s debut with the Flames ended in a 22-save, 2-1 victory over the Montreal Canadiens. And from then on, things only got better. In his first 17 starts, Kiprusoff won 12, and gave up one goal or less in every game from November 20th to December 29th. Several months after, a 1-0 win over the Phoenix Coyotes clinched a playoff berth for the Flames. Kiprusoff’s outstanding play that night earned him his very first standing ovation from the C of Red —a sight that has since become a common occurrence in the Saddledome. 15 wins in the playoffs (5 of them shutouts) propelled Kiprusoff and the Calgary Flames all the way to the Stanley Cup finals. Although the team lost in the end to the Tampa Bay Lightning, what wasn’t lost on anyone who watched the series was the spectacular show Miikka Kiprusoff put on. His performance earned him a nod for the Vezina Trophy, and a $2.95 million contract with the Calgary Flames. A year in Sweden during the 2004-2005 NHL lockout didn’t hinder Kiprusoff at all, and his return to the Calgary Flames as their starting goalie in the following season was an explosive one. He broke Mike Vernon’s record by getting to 40 wins by April 8th, 2006. By the end of the season, he had nabbed a Hart Trophy nomination and won both the William M. Jennings Trophy and the Vezina Trophy. In three short seasons, Kiprusoff rose to become one of the big names in the Flames franchise. He had proved to be an irreplaceable aspect to the team’s success. No goaltender in the league was relied on more heavily than Miikka Kiprusoff, and though he was not the face of the franchise, he was the face most often seen on the ice. From playing only a handful of games a season with the Sharks to playing an average of 75 games per season with the Flames, it became obvious that while Jarome Iginla was at the forefront of the team, Miikka Kiprusoff was the backbone. Of course, playing 90% of the season will take its toll on any workhorse, and despite promises by every single head coach to work with Kiprusoff, the workload did not lighten as the seasons progressed. Although his statistical play was not as good as it had been in previous years because of his heavy workload, Kiprusoff still managed to maintain his top goaltending status around the league. But being a goaltender is a funny thing. A player can get knocked off their pedestal as quickly as they are put on. And a fanbase’s reverence can turn to rage in the span of 60 minutes. 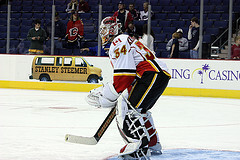 During a period of struggle midway through the 2010-2011 season, Kiprusoff became the subject of jeers from Flames fans for the first time in his career in Calgary. It seemed to indicate that the honeymoon period (an unusually long honeymoon period, to be fair) between the hockey fans of Calgary and Miikka Kiprusoff might be coming to an end. There was still no shortage of spectacular saves and reliability in front of the Calgary net, but as the Flames’ regular and post-season successes became fewer and further between, change was desperately needed within the organization. Rumours of trading certain players who were integral parts of the franchise were running rampant. The 2012-2013 season was the season that set the tone for a much-needed rebuild. The first of the mainstays to be shipped off was Jarome Iginla, and once the captain had confirmed his choice to join the stacked Pittsburgh Penguins, every rumour in circulation had potential to become fact. Naturally, Miikka Kiprusoff’s name was next to appear on the chopping block. 8 seasons of standing on his head to carry the Flames didn’t seem to matter for a team that was aging and slowing down with every game played. The shortened season saw less of Kiprusoff in front of the net and more of a barrage of netminding prospects and new acquisitions, mainly due to a knee injury that kept him out of the lineup for a month. He played exactly half of the 48-game season, and only 8 of those games were victories. His goals-against average crept up to 3.44, the highest in his professional career. The buzz around the rumour mill was that Jay Feaster was looking to send Kiprusoff to Toronto. As usual, the stoic Finn kept to himself and focused on keeping pucks out of the net, but when asked about a possible trade to the Maple Leafs, Kiprusoff simply said he did not want to leave Calgary. So with a trade out of the question, and a career that was slowly winding down, Flames fans (and even members of the organization itself) were left to wonder, What next? If the last two home games of the season were indicative of what’s to come, then Kiprusoff can be expected to retire after the summer. During the April 17th game against the Detroit Red Wings, the crowd cheered to unprecedented decibels for every save Kiprusoff made (particularly for one amazing glove save made in the dying seconds of the game, for the Flames win) and a familiar face made his return to the Saddledome. Brendan Peters, better known as “Kid Kipper” to the Calgary Flames faithful, is a young aspiring goaltender who would come to every single home game dressed as his idol and mimicked his every move during warmups. After a 4-year hiatus from the schtick, Kid Kipper was back, to say a potential goodbye to the man he had looked up to for years. 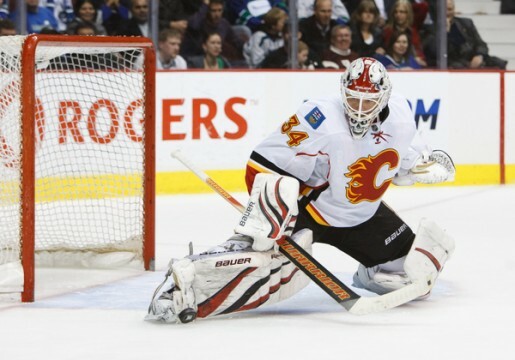 Even Kiprusoff was moved to emotion in his last two games in front of the C of Red. Known for his quiet, focused and unemotional demeanor, Kiprusoff showed visible disappointment when a few pucks slipped past his reach. If these were to be his last games played wearing the flaming ‘C.’ it was clear that he wanted to play his best and be his best in front of his loyal fanbase. With the Calgary Flames off-season in full force, not much has been heard from the organization and the man himself on a career decision. Feaster addressed the media in early May, only to say that the organization is giving Kiprusoff time to think over the summer. Kiprusoff has also opted to keep quiet on his future plans with the franchise, choosing to focus on his family and newborn son, while mulling over his options over the summer. There is plenty of uncertainty surrounding the man who was once the most certain aspect of the franchise. At 36, he is no spring chicken but still posts numbers that put most young goalies around the league to shame. Will another season as the Flames’ starting goaltender strengthen or weaken the team? These questions (and many more) hang in the air, concerning what would be best for the team moving forward and what is best for Kiprusoff. The Calgary Flames are trying to round up a slew of potential goalies in the case that Kiprusoff does retire before the 2013-2014 season. The netminding future of the Flames may be unsure for the time being, but there is one thing that the team and its fans can be sure of, and that is the fact that no goalie for years to come can compare to the legacy that Miikka Kiprusoff has imprinted on the city.